I never got into country music until I met one of my college roomies who listened to it alllll the time. It sounds a little cheesy, but she always had a song in her heart, and on her lips, and she introduced me to the best of the early 90s, inadvertently teaching me all the lyrics. And, I guess it took. Of course, nowadays, I'm finding that my country music love is in stasis. In the 90s. 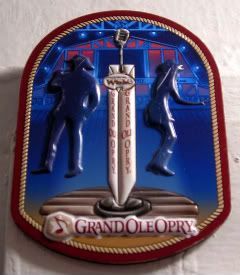 My friend went to Nashville and brought this back for me from her tour of the Grand Ole Opry. I've never been - I mean, I didn't grow up with it in the house, so I guess it's no surprise that we skirted the Opry in favor of Opryland, instead. I just went to go look up Opryland, and realized it was shuttered and demolished in the 90s! Talk about stasis in the 90s. Nooooooo! But it was the Home of American Music, it says! The park had some cool rides, including a bunch of long-lost to memory kiddie rides. And oh, those fun cheesy performances where everyone swings and claps to overenthusiastic "get your hands clappin'!!" performers. What's weird is that I can't really imagine my parents running around at Opryland, going to what had to have been country music performances. I do remember my parents would fob me off on my Uncle Oscar to take me on the scary rides - the most memorable one was a scary, scary plane ride. In my head, I've built into a bunch of planes that were hung from a chain (!!!) That flew around a tower (!!!). But, to be honest it's one of those hazy dazy memories the I distinctly remember being is the air, flying around at breakneck speed, and it was dark. And there may have been a joystick. Or, that was just a hazy dazy memory of being in a cockpit...on television. Found it! Apparently, there was a plane ride. It was called the Barnstormer (natch) and it was a 100-ft-tall spinning airplane ride. Whoa, from Themepark Timelines. Just whoa. Really? My parents let me ride in that thing? Have you tried recent country music? Because, and I hate to admit this, I may have been wrong to poo-poo it for so long. There's some good tunes rockin' the country radio these days. I have tried, but my problem is more that I just don't really make an effort to listen to new music anymore. I tend to stick to my Pandora stations when I'm at work, and I almost never listen to live radio. So I know it's out there, I just can't get to it. Don't hate admitting it. I do love some country artists, I do.